NASA's plan to lasso an asteroid for astronauts as a deep-space dry run for a future mission to Mars has some members of Congress wondering if the space agency would be better off setting its sights on the moon instead. The asteroid mission was announced when President Barack Obama unveiled his 2014 NASA budget request. The scheme would have NASA use a robotic spacecraft to capture a roughly 23-foot-wide (7 meters) asteroid in deep space, and redirect it to an orbit closer to the moon. Once there, NASA would launch a human mission to rendezvous with the space rock and explore it. Yet lawmakers questioned the mission's technical plan, budget and schedule. "I am not convinced this mission is the right way to go, and that it may actually become a detour for a Mars mission," said Rep. Steven Palazzo (R., Miss.). Some members of Congress favored sending astronauts back to the moon instead. Artist's concept of a possible colony on the moon. "To me there is no better way for our astronauts to learn how to live and work on another planet than to use the moon as a training ground," said Rep. Lamar Smith (R., Tex.). "It is difficult to determine what advantages this [asteroid mission] may offer," he added. The moon plan was backed by some experts called to testify at the hearing. The moon is easier to get to, offers greater science objectives, and is a better testing ground for Mars exploration technology, compared to an asteroid, argued Paul Spudis, a geologist specializing in lunar science at the Lunar and Planetary Institute in Houston. "This effort is not 'been there, done that,'" he said. "It is a wholly new, untried and necessary pioneering enterprise in space." But one of the architects of the asteroid mission was there to defend the plan, which he said is a realistic near-term goal for NASA that advances its ultimate objective of going to Mars. "The asteroid retrieval mission creates a first step beyond the moon — the only one we are now capable of performing and the only one which we can afford within the current budget," said Louis Friedman, co-leader of the Keck Institute for Space Studies Asteroid Retrieval Mission Study and co-founder and executive director emeritus of The Planetary Society, a nonprofit dedicated to space exploration. Friedman was co-leader of the study on the asteroid mission concept that sold the Obama administration and NASA on the idea. Astronauts return samples from an asteroid into their Orion spacecraft while orbiting high above the moon in this still image from a video NASA's Asteroid Retrieval and Utilization mission. 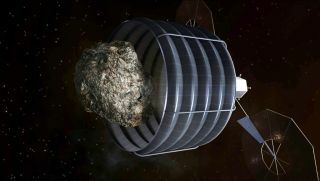 In addition to providing a testing ground for new solar electric propulsion technologies that could prove useful in going to Mars, the asteroid mission would further scientists' understanding of the space rocks that populate our solar system — some of which might need to be diverted from their orbits if they pose a risk of colliding with Earth, Friedman said. The asteroid chosen for retrieval, however, would be too small to be dangerous to our planet. "Nonetheless, the asteroid is big enough to be an interesting object to explore," Friedman said. "We may someday have to divert one. Exploring them and discovering new ones is important." "I believe this is the direct and only sustainable way to Mars," he added. "It is a clever concept and such a mission would undoubtedly demonstrate technologies," said Douglas Cooke, former associate administrator for NASA's Exploration Systems Mission Directorate who now owns the Cooke Concepts and Solutions consulting company. However, Cooke said he wasn't clear on the mission's application to Mars exploration, and he questioned the decision-making process that arrived on the plan without involving enough of the space community. "I think a healthy process gets inputs from your stakeholders in terms of objectives and goals," Cooke said. "I don't see that that's happened here." Ultimately, many agreed that whatever plan NASA decides on, the space agency must be given the funding to achieve it. "NASA is being asked to do too much with too little," said Steve Squyres, a Cornell University astronomer who is principal investigator of NASA's Spirit and Opportunity rovers on Mars. "This overtaxing of the agency is chronic, severe, and it's getting worse."